If your dog has developed an annoying ear problem after having fun at the lake or after a bath, you may be wondering whether swimmer’s ear in dogs is a possibility. Well, here’s a fact: dogs can get swimmer’s ear too, and it can be just as annoying as it is with people. Your veterinarian might not call the condition exactly “dog swimmer’s ears,” but may prefer to rather refer to it as “otitis externa,” the general medical term for an infection of the dog’s outer ear. Fortunately, there are ways to treat swimmer’s ear in dogs, but most of them require medications. Your dog’s ears are normally populated by normal amounts of yeast and bacteria. In a normal, healthy ear, these yeast and bacteria make themselves at home, but don’t typically wreck any sort of trouble. However, if your dog’s ears remain moist after a bath or after a swim in the lake, this moisture provides the ideal environment for yeast and bacteria to thrive, and soon, their numbers may get out of hand. Then, next thing you know, your dog’s ears start to get itchy and and he’s scratching, shaking his head and keeping his head tilted. Of course, all of this scratching will only makes matters worse, adding further insult to injury. Poor Rover! Ear infections in dogs are indeed, quite annoying and can make dogs quite miserable! Certain breeds of dogs because of their ear conformation may be more prone to these annoying ear infections than others. “Recurrent yeast and bacterial infections are typically either due to underlying allergies or due to moisture remaining in the ear after swimming or bathing.” Dr. Ann, veterinarian. Generally, symptoms of swimmer’s ear in dogs appear 2 to 3 days after the dog went swimming or has received a bath. Fortunately, dog swimmer’s ear can be treated with several products. If there is a lot of yeast inhabiting the ear canal, the vet will prescribe ear drops that have anti-fungal properties. If there is a bacterial infection, the vet will prescribe antibiotics. For the associated pain and inflammation, the vet may prescribe anti-inflammatory medications. If there is significant itching, the vet may prescribe an antihistamine. Commonly veterinary prescribed medications to treat swimmer’s ear in dogs include products such as Otomax, Panolog, Baytril Otic and Surolan. Caution is needed with certain products considering that there have been reports of ear drops causing deafness in dogs. Seeing a vet for signs of swimmer’s ear is important. This is because, ear problems in dogs may be due to various causes. At the vet’s office, the veterinarian will look into the ear to ensure the dog’s ear canal is not damaged and that there aren’t any foreign items stuck in there (fox tails, grass seeds etc.). The vet may then decide to take an ear swab to look under the microscope so to determine whether the ear infection is due to yeast or bacteria. This is important so that vet can choose the best ear product to use. Should there be a lot of debris in the ear canal, the vet may decide to flush the ear so that the product will be more effective. If you cannot get your dog into the vet right away for an appointment, veterinarian Dr. Fiona suggests giving plain Benadryl with no added ingredients so to provide temporary relief as long as the dog doesn’t suffer from glaucoma. The dosage of Benadryl for dog eat itching is 1 mg per pound of weight. Another product veterinarian Dr. Fiona recommends is Burrow’s Solution, which can be purchased at a pharmacy. In some places it is called Domeboro solution. The solution has astringent properties which can help in treating annoying annoying ear infections in dogs. You would instill 3 to 5 drops in the dog’s ears while massaging it around. Then, the dog should be allowed to shake his ears, and any excess can be wiped off with a tissue. And what about using Swimmer’s Ear for dog ears? 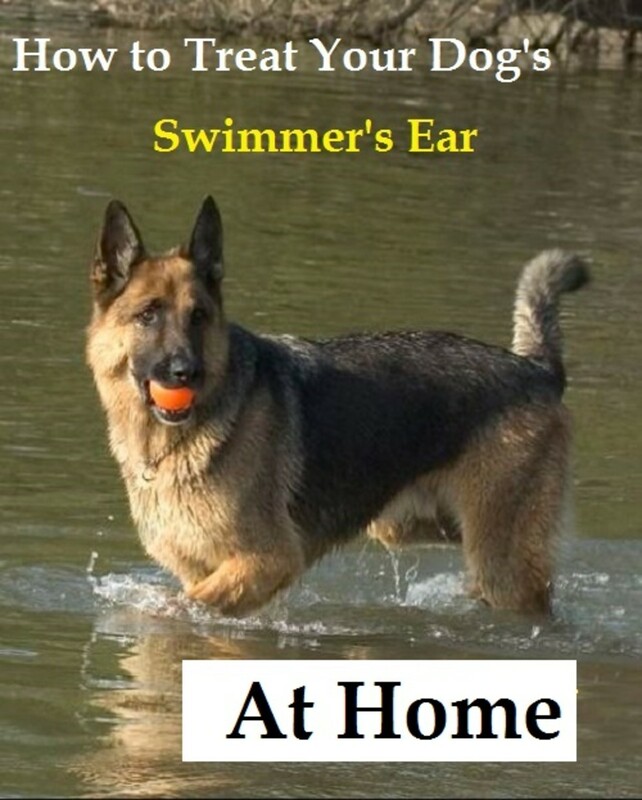 Swimmer’s Ear, can actually be used on dogs too. According to veterinarian Dr. Loretta, Swimmer’s Ear can help dry out the dog’s ear. A few drops can be instilled into the dog’s ears every 8 hours. As with Burrow’s Solution, the ear drops should be massaged and them any excess can be wiped off with a tissue. If this doesn’t work though within 2-3 days, this may be a sign that your dog needs a stronger medication. For those not comfortable using products for humans, they may be happy to hear that there is a Swimmer’s Ear product just made for dogs. Another popular over- the- counter- product to treat annoying ear infections in dogs and that has rave reviews is Zymox for dog yeast infections. If your dog loves to swim in lakes and ponds, your dog’s ears may be prone to developing swimmer’s ears. You may therefore be wondering if there are any options to prevent your dog from getting repeated bouts of swimmer’s ear. Groomers have a special technique up their sleeves which consists of placing cotton balls in the dog’s ears prior to a bath. This prevents any accidentally water drops from accidentally entering a dog’s ear. However, for a dog splashing around, and possibly, diving to fetch a ball in a lake or pond, this is obviously impractical. Another option is to dry up those ears as soon as your dog is done having fun in the water. Simply tilt your dog’s head and put a cotton ball in his ear canal opening. The cotton ball should help catch any excess moisture so that bacteria and yeast aren’t provided with that moist environment they cherish so much. Groomers often also use a drying agent to soak up moisture from dog’s ears such as Swimmer’s ear. Dr. Pitcairn in the book Dr. Pitcairn’s Complete Guide to Natural Health for Dogs & Cats, instead suggests mixing a cup of water with the juice from a half lemon or a tablespoon of white vinegar to a cup of water to flush the dog’s ears after a swim. Let the dog shake his head, and then blot off any excess with a tissue. If the solution appears to burn, he suggests diluting the solution further. “Ears should ALWAYS be cleaned out after swimming or bathing to prevent an ear infection. Another alternative is to use a product called Swimmers Ear Astringent -also used to dry out an ear after swimming/bathing.”~Dr. Dennis, veterinarian.